As one of the oldest coastal towns in Slovenia, and a major port, Koper is an integral part of the country’s infrastructure. This is yet another coastal spot that was once part of the Venetian Empire, and it formally went by the name Caprea. Later, it became part of Yugoslavia. Today, Koper is a lesser-known destination that nevertheless offers several enjoyable attractions. You can tour Tito Square, the heart of the city, explore the refurbished Praetorian Palace or climb the bell tower of Campanile for spectacular views of the city below. There is a free public access beach by the Koper Marina that is ideal for swimming or just enjoying a picnic in the sunshine. Searching for Ajdovscina rooms? Vipava Valley … Golden hues of ripening spill across the greenery. The air is heavy with the scent of apricots, peaches and ripe grasses. If valley days appear too hot, the Nanos, Gora and Trnovo Plateaus offer plenty refreshment, alongside the crystal rivers and springs. Tastings in superb wine cellars make for joyous evenings in good company. Whether hiking, biking, exploring or simply enjoying nature, the perfect summer day lies at your feet …. Ljubljana Castle offers the most beautiful views of Ljubljana. This sixteenth-century castle is easily accessible by foot or by taking a tram. On the top, the café and a restaurant in the castle’s courtyard are a perfect place to rest and enjoy a cup of coffee or taste traditional food. Ljubljana Castle also hosts several permanent exhibitions and offers guided tours. The Romanesque-style Church of the Holy Trinity is located in a small village, Hrastovlje. It is most known for its seven-meter long fresco, The Dance of Death (Danse Mac). Until 1949, when discovered by Joze Pohlen, this magnificent piece of art was hidden under a thick layer of plaster. The Dance of Death portrays eleven skeletons leading eleven people (of different social status) to their grave, with the twelfth skeleton holding the coffin open for them. This art piece was created to remind people that we are all equal in God’s eyes. BLED LAKE: Simply put, Bled Lake is one of the most romantic destinations on the continent. A crystal blue lake, protected by a castle overlooking the waters with a none-more-idyllic island in the middle, Bled Lake is a Disney scene come to life. 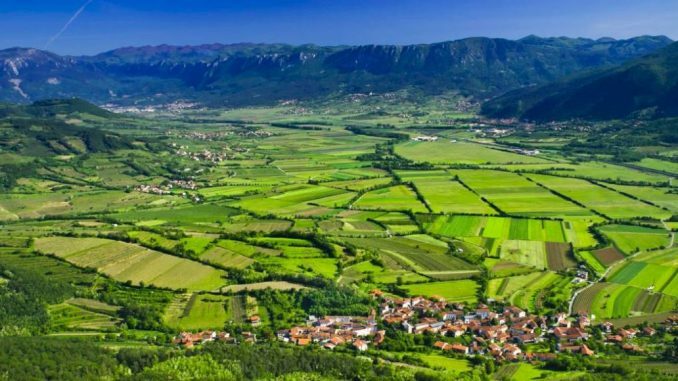 VIPAVA VALLEY: Vipava valley is the windiest region in Slovenia. Burja or bora wind, that blows at a speed of even 180km/h, helps drying prosciutto, keeps fog and clouds away but also causes some problems in traffic. Keep an eye on house roofs. Buildings have stones and rocks on their roofs to prevent the tiles from being blown off. The legend says that the bora wind was decisive factor in a battle in 394. What was the result of it? The Christianity became the only religion in the Roman Empire.. For rooms/accomodations please check Vipava valley rooms. LOGAR VALLEY: A truly stunning glacial alpine valley, Logar Valley is located deep in the heart of the Kamnik-Savinja Alps. An excellent starting point for many gorgeous hikes, the natural sights of this area take the breath away.